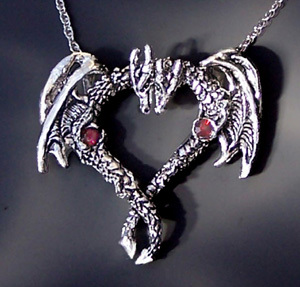 Two loving dragons wrapped around each other make a great necklace, or TWO people can each wear one dragon, knowing their dragon is half of a heart. Each dragon holds a sparkling crystal in their front paws. This design comes with two chains, and is made by hand with lead-free pewter. When worn together, they are 2" across.